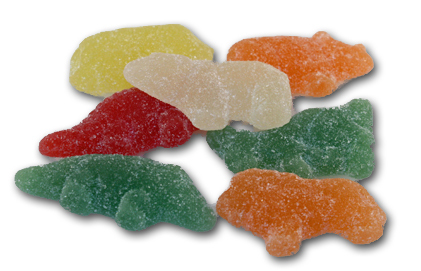 Home » 5 Freshest » Haribo Sour Zoo Are A Delight. 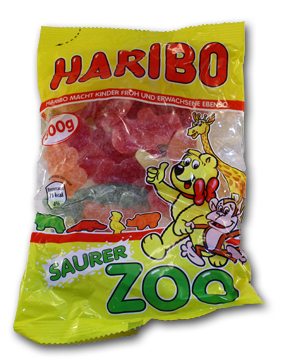 Haribo Sour Zoo Are A Delight. Haribo is an odd company. Obsessed with childlike candies, never venturing into the world of adult flavors or different formats, always sticking to the gummies…you’d think they would have flopped miserably by now. So realistic, it’s almost like being in the swamp, no? No? Agreed. I’m thinking the green one on the bottom left is a gator, the orange on the bottom right a lion, and maybe the white one is a polar bear aspiring to catch a fish? These are very important musings to be sure, but after I take an introductory look at a candy…I don’t really care what the shapes are. Like I said before, that’s for the kids, and while I might be extremely immature, I’m pushing nursing home age, so…wait…what was I saying? Where are my pants? The texture of these is virtually the same as the outstanding Haribo Fruit Salad. Not quite a “gummy”, but more of a tough fruit…gel type thing. Yet firm and chewy. Very satisfying, very yummy. the flavors, familiar as always, include apple, orange, lemon, strawberry, and I think pear. The sour level on them is quintessential Haribo- very sour, very flavorful, and not just a coating of sour sugar : the sour’s cooked in, yo! I eat these the same way I eat Haribo Fruit Salad : way too many in way too short a time. Highly addictive, I had to shelve the other half of the bag for Matty Guru. That is, unless he pisses me off before I see him next, in which case Jonny & Jonny Jr. will inhale them. Fair warning. I’ve searched every candy site I know of, and these just aren’t available for us here in the states. Even if you DID speak German, the candy packed site of World of Sweets doesn’t even carry them (but it has everything else in the world, so give it a shot if you’re daring), so I’m not sure what to tell you. Until such time as the Candy Gurus’ dream is realized – a pipeline of ALL varieties of Haribo available to all of us- then we’ll just have to sit tight. In the meantime, I’ll continue to send Susie weirded out pharmacy procured sugar-free candies in the hopes that she continues to share with us what the fine people of Germany get to see every day, in every corner store. Haribo was founded in 1920 by Hans Riegel Sr. The company headquarters are in Bonn, Germany. “Haribo” is an acronym for Hans Riegel, Bonn. Ha Ri Bo. Don’t you feel smarterer now? Sour isn’t overpowering, it’s one of the only “sour” candies I would describe as pleasant. Flavors are awesome, most are natural in European varieties. I’m always annoyed that we can’t get most of their offerings stateside. “non-sugar eating-spin instructor-sugar-free candy addict friend from Germany”? “The texture of these is virtually the same as the outstanding Haribo Fruit Salad. Not quite a “gummy”, but more of a tough fruit…gel type thing. ” ?